How many times has it happened to you — you’ve just finished reading a long article and you wanted to move on to a different page but navigation was nowhere in sight. A scrolling-workout would follow. Sticky Header free WordPress plugin we’ve released allows you to add a fixed navigation to any WordPress theme. Most people would agree that navigation is one of the most important components of any website. Despite this, it’s not always easy to use or access it. Fixed (sticky) navigation is a website menu locked into place, so it never disappears when a user scrolls down the page. It is omnipresent and accessible from anywhere on the website without the need to scroll. Browsing a website that has sticky header makes you feel comfortable, because “the wheel” is always in your sight and you could easily switch lanes if you wanted to. You can choose whether you want to present your fixed header to mobile visitors because their lack of screen real-estate and their scrolling habits don’t require one. Sticky header plugin has you covered. By configuring the Hide if screen is narrower than option, you can choose when or whether your fixed header should appear. Not only does it improve the overall experience and increases satisfaction your visitors get, but your sticky header works on your branding, too. By uploading you logo, your branding is ever visible. The longer your branding stays before your users’ eyes, the bigger the chance they’ll subconsciously remember it and recognize you in the future. Some people don’t like sticky headers because they interfere with the clean look of the page and present a distraction. When you design yours, make sure you blend it nicely so it doesn’t pop out too much. Your branding and navigation should be visible and easily accessible, but it should never compete with your content. With the giants, such as Google, Microsoft, and others which use fixed headers, they’ve recently gained popularity. Consider implementing one on your website, it’s super easy with our Sticky Header WordPress plugin. It may improve your branding, usability and the overall user experience of the website. As always, your opinions and suggestions are welcome in the comment area below. Update: There’s another free plugin in the WordPress.org repository called Awesome Sticky Header by DevCanyon. It’s somewhat more complex and allows for more customization. 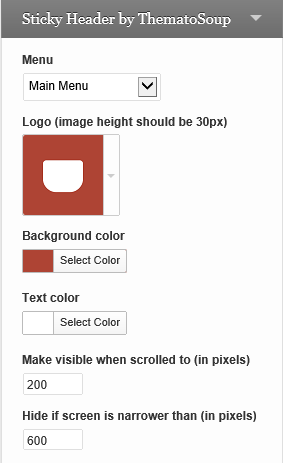 You can set your logo, menu, submenus, secondary menu, search, colors, backgrounds and even transparency. Check them out and see if they make your website more user-friendly.